A partial lines drawing of this boat was published in D.W. Fosteles' book, "Speedboat". They came from the renowned Lawley yard and I was able to acquire what little drawings there were from The Mystic Seaport Museum. They had a plan view, profile view, but only 3 sectional views. Ken Bassett and I filled in the blanks on the Loft Floor. My client fell in love with these drawings, said this was his dream boat. He said he would commission me to build it if I could come up with the engine. She is powered with a 1917 WWI Liberty Aircraft engine. I did and that's a story too long for here. This boat was drawn in 1924 and we don't know if she was ever built back then. She is quite the vessel, utility style like a big pickup truck, forward console. The Liberty V12 engine has a sound like no other engine, open overhead valve train with valves clicking away and oil flying out of the top of the engine. She burns 20 gal. of gas and one gallon of oil per hour. This boat was built as close as I could to what I thought the original designer had in mind. 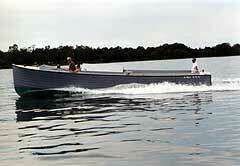 If you hear this boat coming give way, she is equipped with a Thompson sub-machine gun and a B.A.R. rifle. If you can catch up with her you might get a shot or two of rum from the owner.